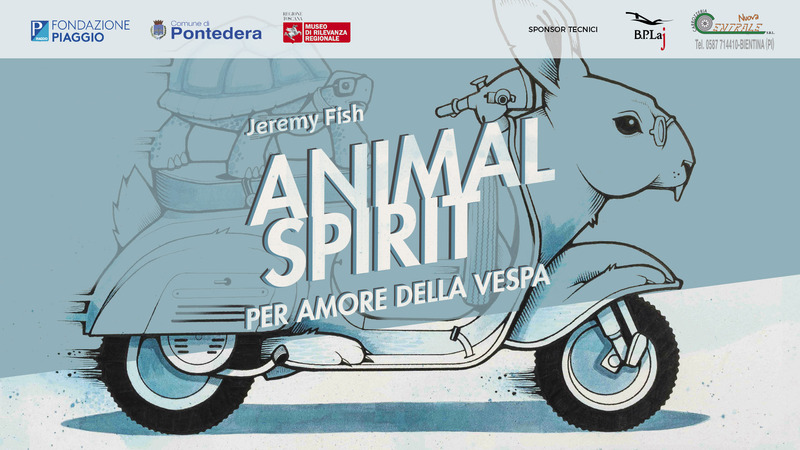 Piaggio Museum features Jeremy Fish on a solo show that presents the most important vehicles of Piaggio’s collection interpreted and portrayed in their “animal spirit”. Jeremy Dan Fish was born in Albany, New York in 1974 and relocated to San Francisco in 1994. He received a BFA from the San Francisco Art Institute in 1997 with an emphasis on painting and printmaking. Fish’s education and work experience has led to a successful career as a fine artist and commercial illustrator. Finding a balance between exhibiting his work across the US, and internationally in galleries and museums. While producing commercial illustration projects for a wide range of corporate and independent clients all around the world. Fish was the first ever San Francisco Arts Commission artist in residency at SF City Hall in 2015 to celebrate the 100th birthday of the building. He was also the artist in residency at Coit Tower in San Francisco in the summer of 2017. Mr Fish created the Haight Street Bronze Bunny statue in 2016, and is the largest crowd funded public bronze statue in California. In 2015 Mayor Ed Lee officially declared that November 19th is “Jeremy Fish Day” in the city of San Francisco.